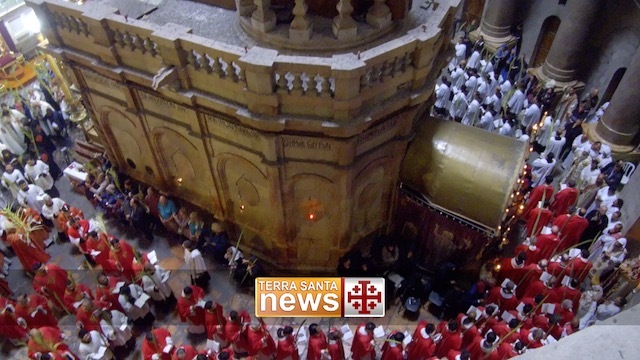 home / Multimedia / The Holy Land in news / Holy Land Mosaics – A bridge of tesserae across the .. Following the success of the exhibition of copies of the Dome of the Rock mosaics, which was on display in the Palestinian Territories and Jordan during 2009 and 2010, the Mosaic Centre of Jericho is mounting its own exhibition in Hebron of copies of ancient Palestinian mosaics. The inauguration of the exposition will take place on 19 July at 13.00 at the Museum of the Old City in Hebron, in the presence of the authorities, on the occasion of the 15th anniversary of the Hebron Rehabilitation Committee and the opening of the International Conference on the Development and Economic Revival of Historical City Centers. The exposition, product of a collaboration of the Mosaic Centre of Jericho with the Hebron Rehabilitation Committee (HRC) and ATS pro Terra Sancta, presents a number of examples of the most beautiful Palestinian mosaics, coming from a wide variety of both locations (churches, mosques, palaces, mansions, etc.) and historical periods. The copies illustrate the great value of Palestinian mosaic heritage and testify to the rich and diverse historical, cultural and religious traditions that coexisted in the past in this territory. The exhibition also illustrates that mosaic art is an enduring phenomenon, as alive with innovation today as it was thousands of years ago. 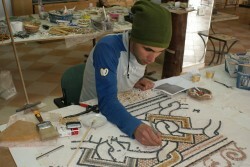 Eight mosaic artists – two European and six Palestinian – have joined together to reproduce some of the most beautiful examples of mosaic art masterpieces of the past, using ancient techniques and materials. Thanks to their work Palestinian mosaic heritage can be admired today in all its splendor. The exposition has been made possible thanks to a €50,000 grant by the European Union, awarded as part of the EU’s annual cultural activities program. The exhibition will be on display in the Museum of the Old City of Hebron from 19 July until 8 August, and then will move on to Europe. For a number of years the Mosaic Centre of Jericho, with the support of the Associazione di Terra Santa (ATS), has been trying to revive mosaic art, which was so important and relevant in ancient times in the Palestinian Territories, and to provide skilled staff with the training they need in order to be able to carry out in a professional way the preservation and enhancement of this great heritage. To preserve the cultural heritage of Palestine is not only an opportunity for cultural exchange and dialogue, it is a must for the benefit of the future generations of all humanity. It also represents one of the best opportunities for sustainable development through sustainable tourism for the region.